This image shows a hydraulic drill being used to create excavation boundaries for the forthcoming Giant Magellan Telescope. More than 4,000 cubic meters of rock will be removed in preparation for the pouring of the concrete foundations for the giant scope and its support buildings. The construction of a gigantic new telescope has kicked into high gear in the Chilean Andes. 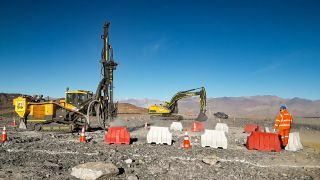 The Giant Magellan Telescope (GMT) has now entered the "hard-rock excavation" phase, which will make way for the huge structure's foundations, leaders of the $1 billion project announced on Tuesday (Aug. 14). Hydraulic drilling and hammering of the site is expected to take five months. The foundations that will be poured in after that will support the weight of the telescope, which is estimated to be about 1,600 metric tons (1,700 tons), according to a GMTO statement. The telescope is expected to begin operations in 2024. "In total, we expect to remove 5,000 cubic meters [6,500 cubic yards], or 13,300 tons, of rock from the mountain and will need 330 dump-truck loads to remove it from the summit," GMTO Project Manager James Fanson said in the statement. That newly initiated digging work will go about 23 feet (7 m) down into the rock at Las Campanas, GMTO representatives said. When it's completed, GMT will have seven primary mirrors, which together will have a combined light-collecting surface that's 82 feet (25 m) wide. These mirrors will be supported by a steel structure, which will be placed on the concrete pier that Conpax's current excavations are paving the way for. Las Campanas sits beneath very dark and clear skies, which provide exceptional views of the universe. GMT team members believe this location, paired with the telescope's technology, will allow astronomers to make groundbreaking discoveries in a variety of fields, from cosmology and astrophysics to astrobiology. "The GMT mirrors will collect more light than any telescope ever built, and the resolution will be the best ever achieved," project team members wrote on the GMT website. "This unprecedented light-gathering ability and resolution will help with many other fascinating questions in 21st-century astronomy," the team members added. "How did the first galaxies form? What are [the] dark matter and dark energy that comprise most of our universe? How did stellar matter from the Big Bang congeal into what we see today? What is the fate of the universe?"